← Adios Portugal, Hola Espana! We have made it to Cadiz Bay today where we are spending the next week celebrating Liz’s 50th. Her Mum and Dad are due in tomorrow so we will pick them up from the airport in the evening. We left Mazagon this morning about 1100 Spanish time for the 40 mile journey to Rota. We were disappointed with the last marina as they had no wifi and we needed to rewire our cables to get an electricity connection so we didn’t bother. Consequently, we were not happy to have to pay €35 for the privilege. 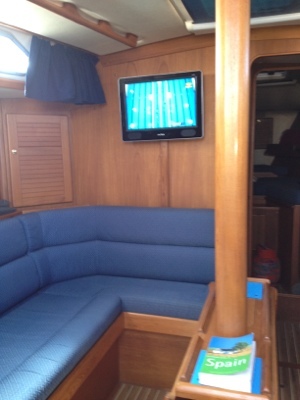 We have managed to retune our tv so that we can watch the olympics and even managed it as we sailed along! We arrived in Rota to find that we did have electricity but no wifi! We need to sort that out as having a week here without it is going to be a nightmare or very expensive as we will need to be buying a lot of beers to get connected in the local bar!